Dayna Lorentz is the author of the Dogs of the Drowned City series (Scholastic) and No Safety in Numbers. Her latest book is No Easy Way Out, the sequel to No Safety in Numbers. I just finished Brave New World by Aldous Huxley, which I read with a high school student I’m mentoring. I loved how the book played with my expectations. The story went exactly where I thought it would—the journey from Inside to Outside and back again—but in a completely unexpected and wonderfully jarring way. In terms of the science and technology of the story, it was interesting what advances Huxley could not envision—the Internet, for example, or computer-operated elevators, or jets. It made me think about the limits of my own imagination, or any author’s: how writers’ creative powers are constrained by the times, and particularly the scientific paradigm, in which they find themselves. 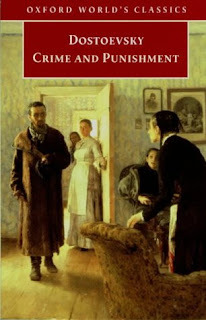 I’m also reading Crime and Punishment by Fyodor Dostoevsky with my book group. At one point in Part Two, a significant fact is revealed that changes the reader’s entire understanding of everything that has come before. My book group had an intense discussion about whether this was Dostoevsky screwing up and not being able to go back and edit once he was so far into the manuscript (Would he have done things differently if given a word processor, or even a typewriter and some Wite-Out? ), or whether there was a plausible, character-based reason for why this critical fact was not revealed earlier. Also on my nightstand is Game of Thrones by George R.R. Martin. Having watched the TV show version of the story, I’m finding it fascinating to go back and see how the story is different—not in fact, but in feel—experiencing events not through the cold, objective eye of the camera, but through the constricted, subjective viewpoints of the various characters. Finally, I’m reading in a rather scattershot way Letters to a Fiction Writer, edited by Frederick Busch. It’s wonderful to peek into the writing lives of others. Writing is such a lonely profession—most days, it’s just me and my imaginary friends—that it’s a comfort of sorts to know that there are so many others out there, struggling alone with their imaginary friends, too. Visit Dayna Lorentz's website and blog. My Book, The Movie: No Safety in Numbers.